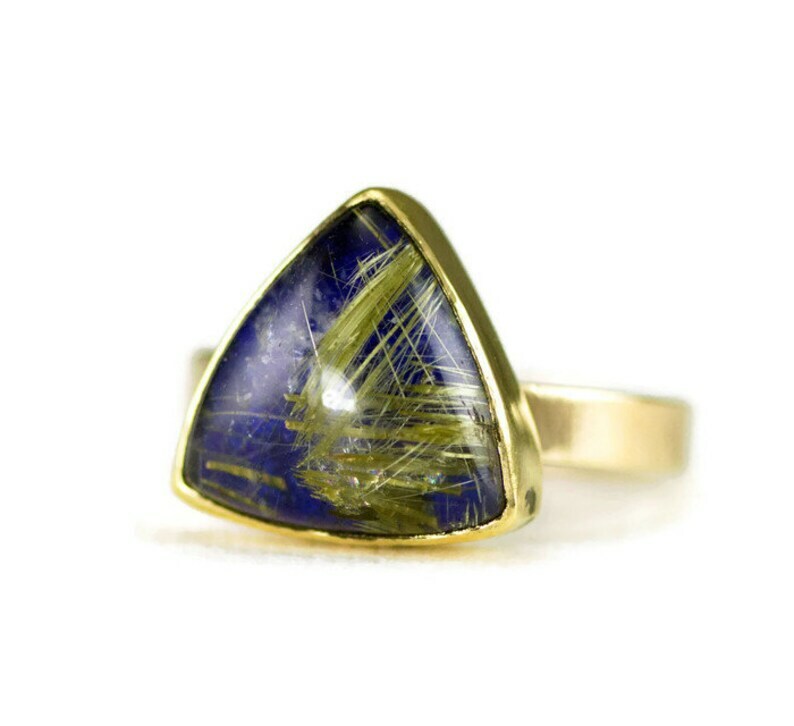 A beautiful 14k gold trillion ring created with a lovely golden rutilated quartz over lapis doublet stone. This solid 14k gold bold statement ring features an 18k gold bezel set stone on a solid 14k gold back on an interrupted 3 x 1.3 mm band. This designer stone was created by bonding the golden rutilated quartz permanently to indigo blue lapis lazuli. The clear quartz background allows the beautiful blue to show through and really make the gold rutiles stand out.With such a beautiful eye catching stone, this simple, clean setting shows the stone at it's finest. This ring has a slight U shape band soldered under the setting. This allows for a bit of flexibility in size- it comfortably fits 7- 7.5 and allows the ring to easily slide over even large knuckles. Requests to re-size will add 3-5 days to delivery time. If the ring is a gift and you are unsure of size, I recommend ordering the ring as is and return later for sizing. The stone is made by combining the cleanest, beautiful blue Lapis Lazuli with the clearest brightest Rutilated Quartz. I choose ethical stones that will provide the biggest wow factor but also give you a durable classic ring you can wear daily. Your ring will ship fully insured with tracking, signature required unless waived. Shipping upgrads ar availble. Ring is gift boxed and includes a satin storage pouch and small polish cloth. Please read my shop policies on custom orders and ring re-sizing and ask questions before purchase.